WordPress as a content management system is really powerful if you want to host a website or a blog for yourself. It will let you do that for free. There are even free and premium themes and templates that are available which you can use corresponding to the idea of the website. Here you will find the best kindergarten WordPress themes and templates that you can apply to your kindergarten, child care or any other children’s education and play center. 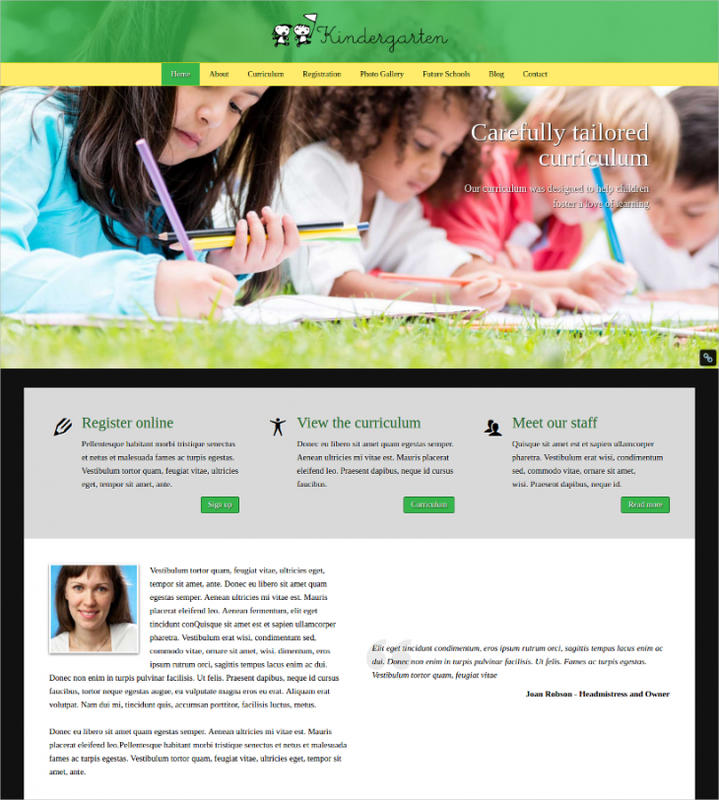 You can also check out school website themes and templates in case your website requires so. 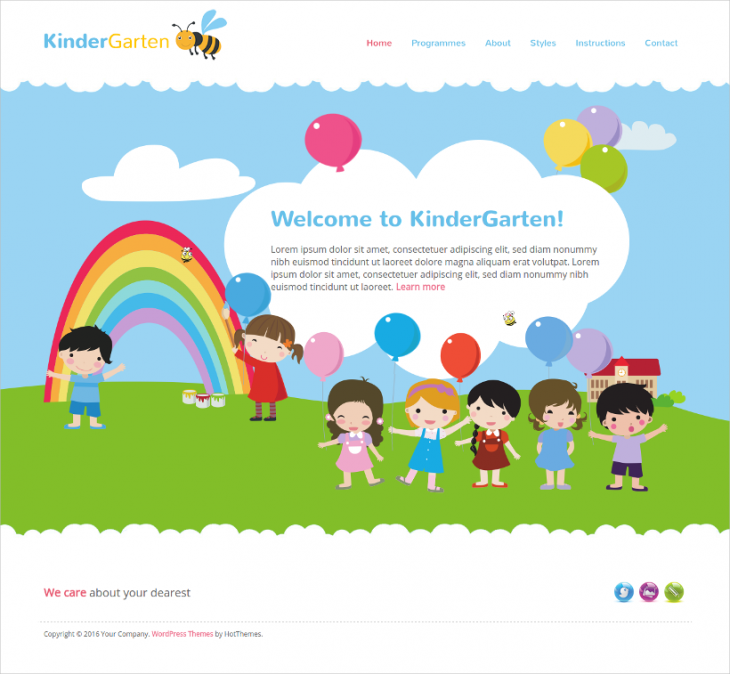 If you want to give your kindergarten or preschool website a really professional look then check out this theme called HappyChild. The design is completely responsive and is based on the Bootstrap 3.1 grid standards. The download will also include the PSD design along with 8 premium plugins that come with the theme. 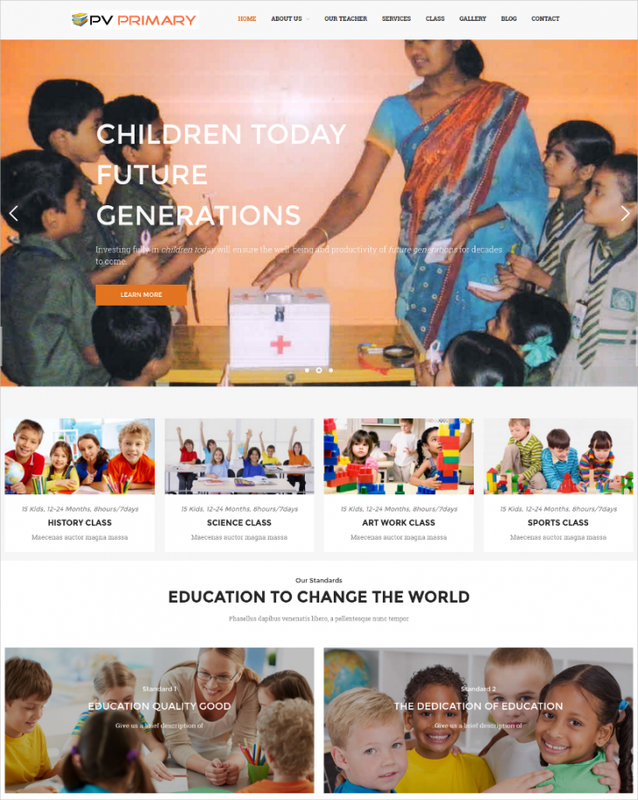 Kiddz is a premium responsive WordPress theme for your kindergarten or education related website that you can download for 59 dollars. The theme also supports different web browsers like Chrome, Explorer, Safari and Firefox. If you want the vector illustrations and PSDs for the web design along with the theme package then this download will do exactly that. The cool artworks add to the charm of the existing kids-themed websites with the use of cartoon like trees and other designs. 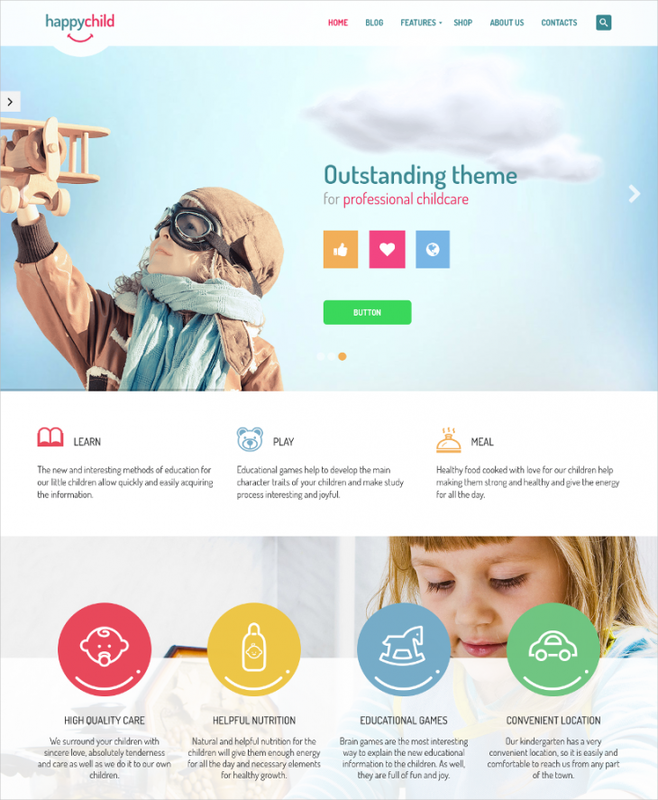 Check out this brilliant Kindergarten WordPress theme on ThemeForest. The UI of the theme is quite elegant. It includes live customizer so that you can see the changes you are making in real time being reflected on the website. It is really important that the content of your website is SEO friendly and improved the page rank of the site. This theme called Hot Kindergarten provides such code apart from being responsive and providing 3 pre-defined styles and layouts. 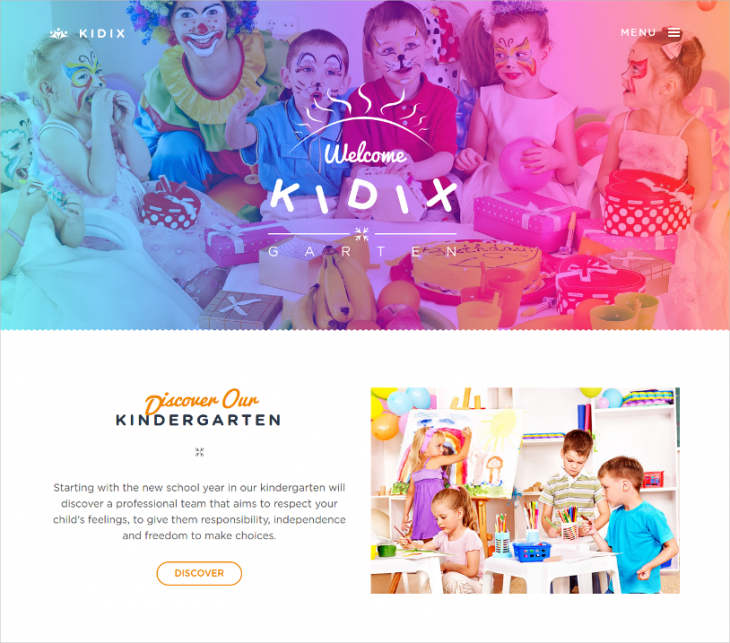 Kidix is another kindergarten WordPress theme. The theme comes with a Visual Composer that will help you design and create the layout of the website using beautiful page elements. Check out the theme on ThemeForest for more information. 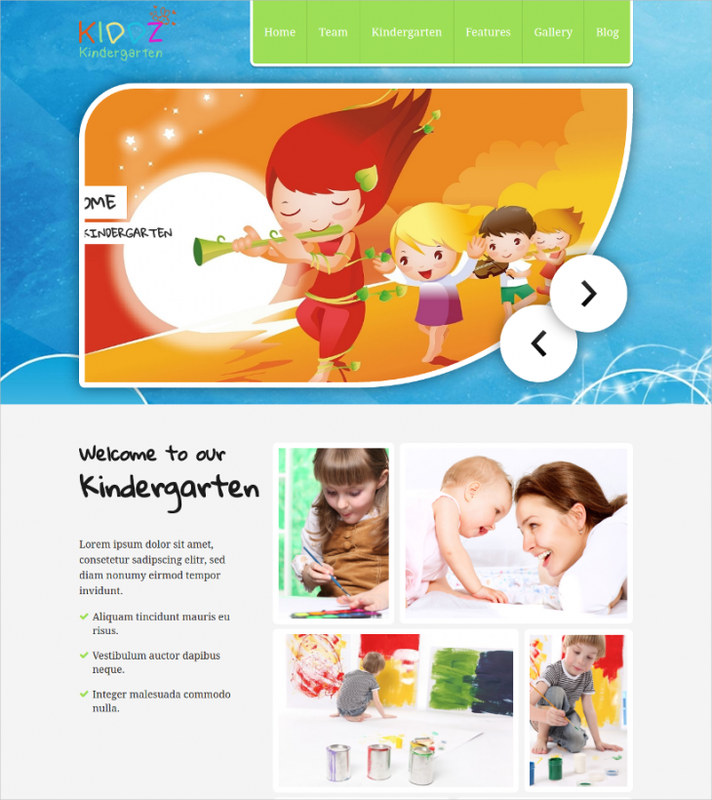 NT PRISKUL is a really cool WordPress theme for your kindergarten website. You don’t have to worry about different device screen sizes as the responsiveness of the theme takes care of that. The theme is embedded with LayersWP framework and lets you design the website in simple drag and drop of wisgets. 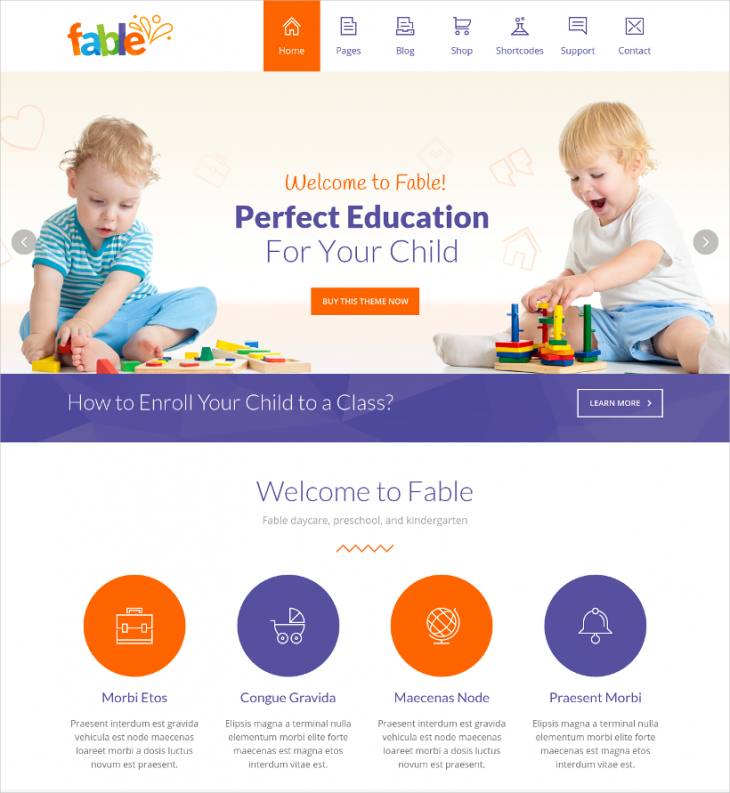 Check out Fable for any website related to the field of education. This theme will funk up your website with the cool choices of font and amazing artworks and designs used as icons and images. You can even check out the live demo of the theme in the given link. 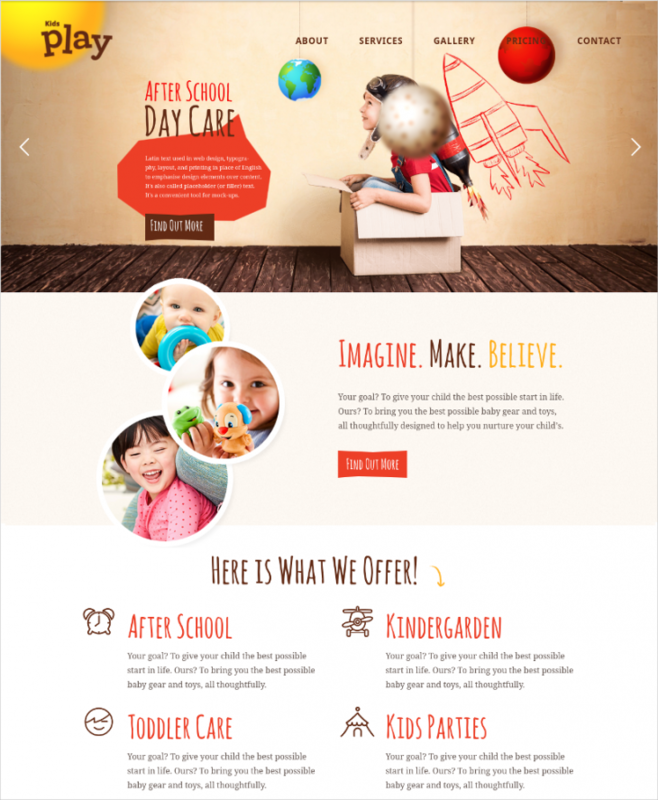 Here is a free WordPress theme called Kindergarten by Mark Brown. Even though free, it includes all the necessary features a theme is supposed to have, including responsiveness and support of custom widgets. 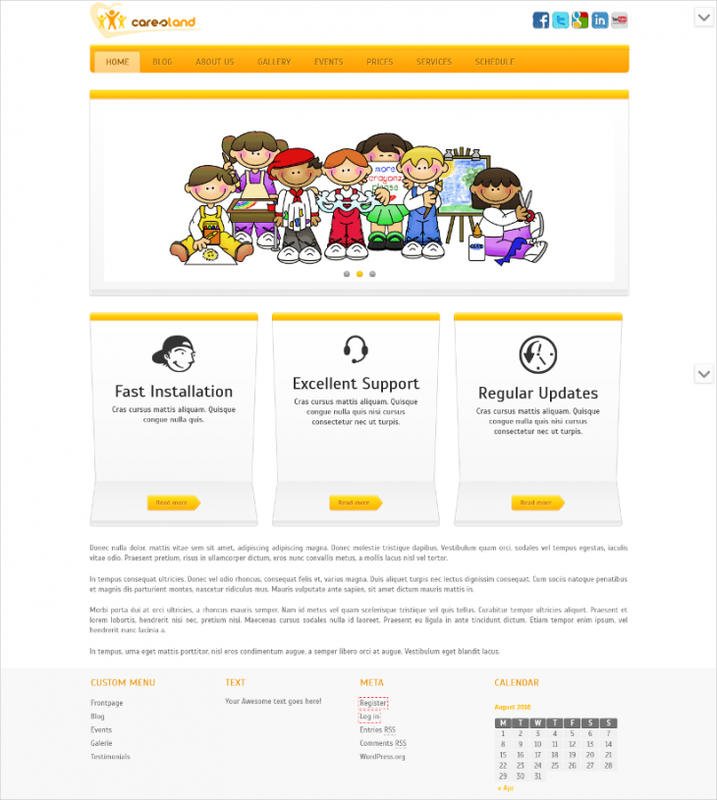 This is a daycare and child care WordPress theme that you can definitely use for your kindergarten website. The theme is compatible with all the modern day browsers and will let you tinker the various elements of the website using theme control options. 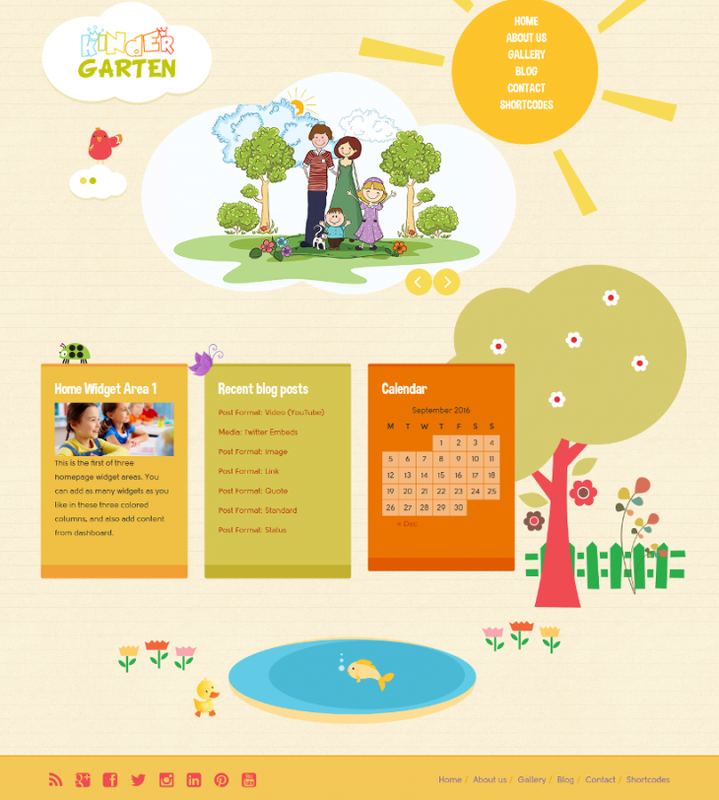 Here is a really amazing WordPress theme for your kindergarten website. It includes unique sliders and custom gallery. The images are automatically shaped into clouds without any editing. It also uses vector illustrations to add to the charm of the site. Kidzone is a perfect theme for educational organizations’ website for learning and information. It includes various widgets which will great to showcase and present the details of the organization in a really elegant way. You can see the live preview before applying it to your own website. 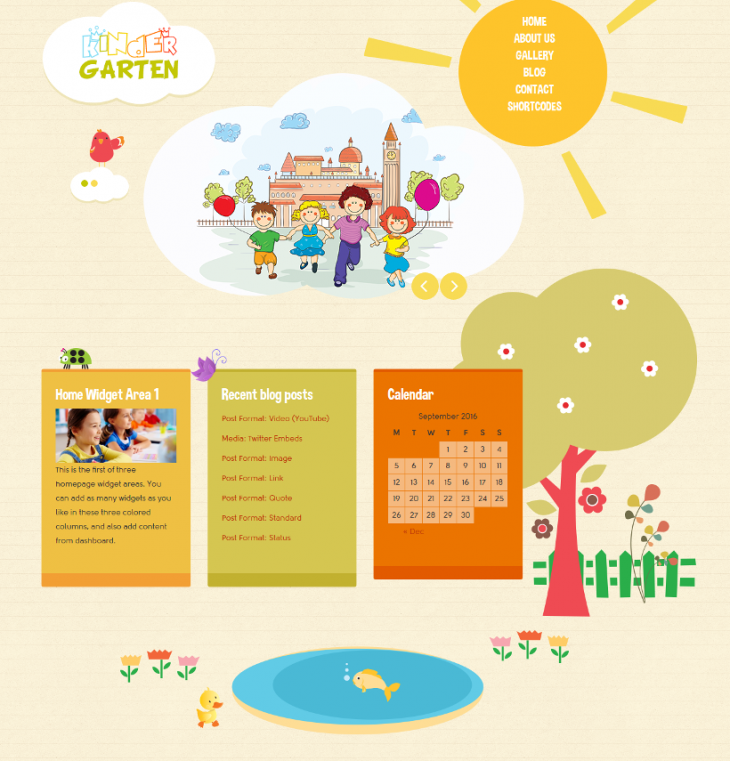 A kindergarten website is supposed to be colorful and joyful. 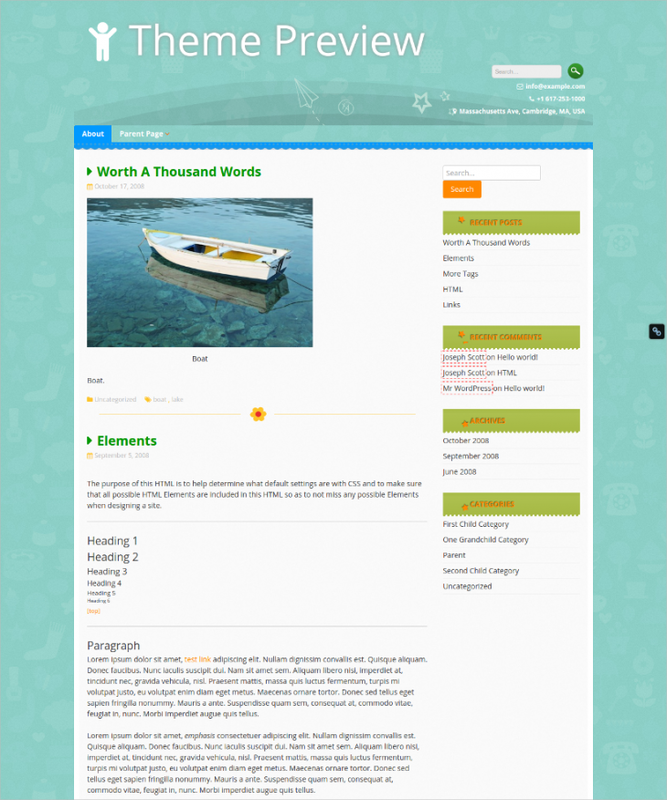 And that exactly is achieved through this amazing kindergarten WordPress theme. The experience is accentuated through the use of brilliant animation effects. This theme will keep the design playful, but also professional enough for the parents who will be in the end looking at the website. The layout has been designed keeping in mind staff information, term dates, online registration form and various other options relevant to education website. The use of themes is really important when it comes to WordPress websites. And in case yours is related to kids and their education then one of these themes will suit your eyes and design for sure. The themes should be meaningful to the kind of website you are having. In case it is for a bookstore, then it is important to have infinite scrolling. Similarly it is always important to make sure the theme is responsive. 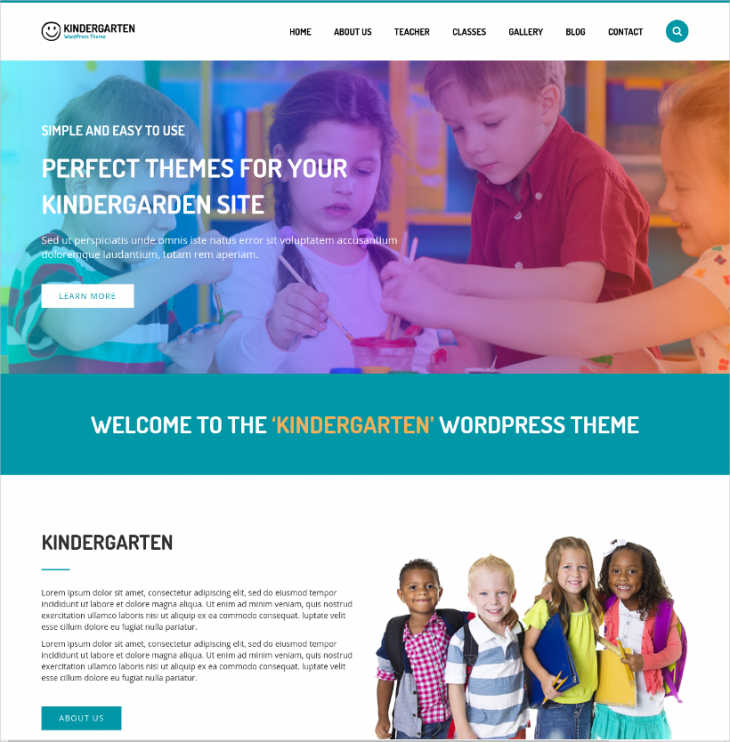 If you are looking for themes not specific to kindergarten and school, then you can also just check out some of the responsive WordPress themes and templates where you will find a wide range of themes to pick from.